Scott Bonney, left, of Neumann/Smith Architects, talks with Newcombe Clark, a partner in The Moravian development. Neumann/Smith is the architect for both The Moravian and Zaragon Place 2. At right is Tim Stout of O'Neal Construction. Monday afternoon’s public forum for Zaragon Place 2 – a proposed 14-story apartment building at the southeast corner of Thompson and William, next to Cottage Inn – was held by the developer and his team to comply with the city’s citizen participation ordinance. 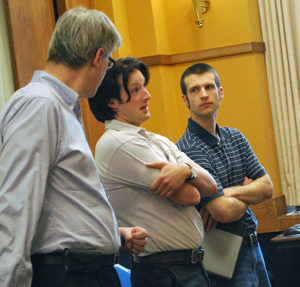 But among those attending the two-hour open house at the Michigan Union were developers for both The Moravian and Heritage Row – two residential projects that have been vigorously opposed by some residents in the city’s near-south side. There are significant differences among the three projects, but some connections as well, especially among the project teams. And all are at different stages of the process: plans for Zaragon Place 2 haven’t yet been submitted to the city’s planning department, while Heritage Row has been recommended by the planning commission and is expected to come before the city council in May. Meanwhile, in a grueling April 5 city council meeting that lasted well past 1 a.m., The Moravian failed to get the eight votes it needed for approval. Nearly 90 people – both supporters and opponents – spoke during a 3.5-hour public commentary on the project. Based on reactions at Monday’s open house for Zaragon Place 2, it seems unlikely this latest project will arouse similar passions. The purpose of Monday’s citizen participation meeting was to comply with an ordinance that the city council passed in 2008 – taking effect at the start of 2009 – which requires that the developer hold a meeting about the proposed project prior to submitting it to the planning department. Property owners, residents and neighborhood groups within 1,000 feet of the project must be informed of the meeting – for Monday’s event, notices were mailed to about 1,500 addresses. The number is high in part because Zaragon Place 2 is just down the block from Tower Plaza, a 26-story condo building. There was no formal presentation at the two-hour open house. Rather, developer Rick Perlman – a UM alumnus who lives in Chicago – was on hand to answer questions, as were architects with Neumann/Smith Architects of Southfield, which also designed Zaragon Place on East University. 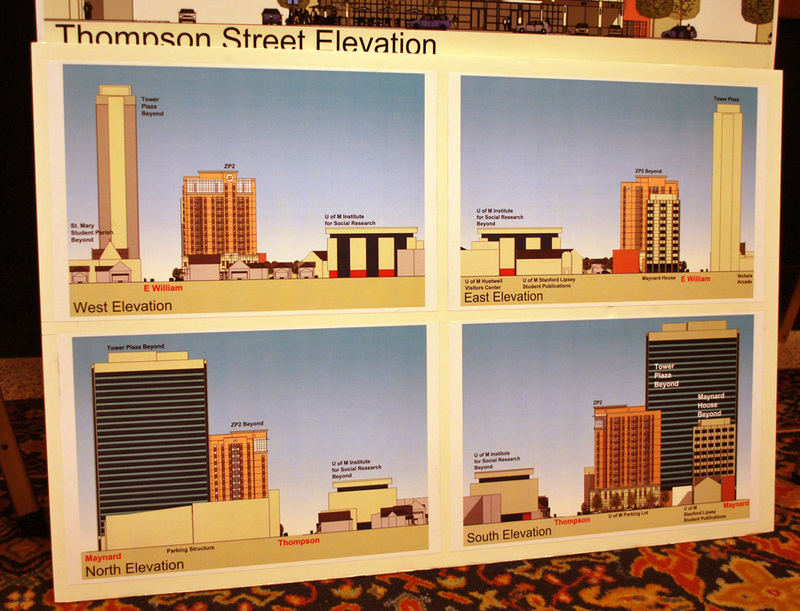 Initial floor plans and renderings of the 14-story building were displayed on easels. Facing north: Site of the proposed Zaragon Place 2 at the southeast corner of Thompson and William. 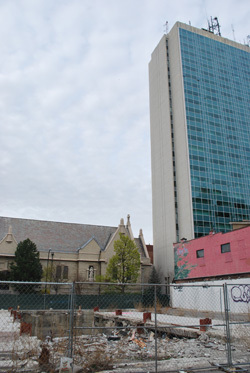 To the right is the 26-story Tower Plaza and the pink west wall of Cottage Inn restaurant. Zaragon Place 2 – called ZP2 – is a sister building to the original Zaragon Place, Perlman told The Chronicle, with many of the same attributes. Like the first Zaragon, ZP2 will have first-floor retail, which will front Thompson and William streets. The 99 apartments will have 10-foot-high ceilings, stainless steel appliances, granite countertops and floors made of rubber from recycled tires. Both Zaragons have fitness rooms. Rent will likely be in the same price-range for both complexes, around $1,000 per tenant – “or whatever the market will bear,” Perlman said. The mix of apartment sizes hasn’t been set, but there will be one-, two- and four-bedroom units housing between 200-350 residents. There are 248 tenants at Zaragon Place on East University, which Perlman said is serving mostly undergraduate students. ZP2′s location on the opposite side of campus will likely attract a higher percentage of graduate students – from the law school and business school, for example – as well as young professionals, he said. About 40 parking spots will be included on the second and third levels of the building – in contrast to the other Zaragon, which has underground parking. And being on a corner lot with no tall buildings on either side allows for windows on all sides of the structure – every bedroom will have a window. Cottage Inn is a two-story building to the east of the proposed apartment complex. To the south is a University of Michigan surface parking lot. The location on a corner lot – former site of a long-vacant bank building – should make it easier to build, Perlman said. He’ll be using the same team that worked on Zaragon Place, including Neumann/Smith Architects, O’Neal Construction as general contractor, and Midwestern Consulting for civil engineering work. This project could be the first one approved under the city’s new A2D2 zoning – the site is zoned for D1, which allows for the densest development. Unlike The Moravian and Heritage Row, which are planned unit developments (PUDs), ZP2 is intended to be a “by right” development, meaning that it conforms to the site’s existing zoning codes. The final piece of the A2D2 effort – the A2D2 design guidelines – haven’t yet been approved by the city council, but architect Scott Bonney said they’ve looked through the draft guidelines and are comfortable that the project will comply. Plans for ZP2 will likely be submitted to the city’s planning department within a few weeks, with the hope it will come before planning commission in June and to the city council by August. If approvals are secured and construction can start this year, the project could be completed by 2012. Monday’s Citizen Participation Meeting: Who Showed Up? Most of the people who attended Monday’s meeting came during the first hour, and included a mix of residents, students, business owners and people associated with other developments. 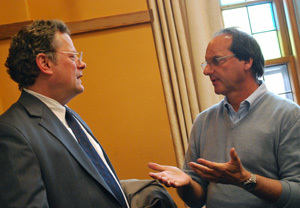 Rick Perlman, right, developer of Zaragon Place 1 and 2, talks with Tom Luczak, a resident of the nearby neighborhood. More residents mean more potential customers to keep stores in business, Davidson said. The State Street/East Liberty district has been hard hit by the economic downturn, losing long-time retailers Shaman Drum Bookshop and the John Leidy gift shop within the past year. Shaman Drum closed last summer after nearly 30 years in business. John Leidy, which opened in 1951, went out of business this February. Peter Allen was one of several developers who came to the open house. Alex de Parry, developer of Heritage Row, attended as well. And Brad Moore, the architect for Heritage Row, had been one of the earliest to arrive. [Moore also does work for Cottage Inn, next door to the ZP2 project.] De Parry said his project will likely be coming before the city council for first reading on May 3. It was approved by planning commission at their March 16 meeting by a 6-2 vote. Newcombe Clark, a partner in The Moravian project, showed up toward the end of Monday’s open house for ZP2. Several people on the Zaragon team – including Neumann/Smith Architects and Scott Betzoldt of Midwestern Consulting – had worked on The Moravian as well. Yet another connection to Clark had nothing to do with development, however. Tim Stout of O’Neal Construction, the general contractor for ZP2, was heading to a marketing class later that evening for the UM Ross School of Business MBA program – Clark is taking the same class. Random question: Doesn’t building a building like this implicitly prevent replacing the Cottage Inn building with a tall building in the future? If so, how does this building have the “right” to do that? Could they at least give the project it’s own name? It is going to create a lot of confusion with pizza delivery guys and others going to the wrong place, etc. I second that. It’s a easy thing and giving the project it’s own name would certainly simplify things. I’d also like to see the elevations/renderings for the project. My guess is they will try to borrow as much as they can from the original Zaragon to save money on architecture commissions and construction costs. I’d like to see some originality. @ Eric, that’s a really good question. I’m not sure that it would prevent a tall development on the adjacent properties with the obvious issue of what happens to the windows in the Zaragon building that would face it. In other municipalities (such as NYC, I believe) you are not allowed to place windows on an exterior wall that is on the lot line unless you buy the “air rights” to the adjacent property or have a set back that meets or exceeds the minimum. 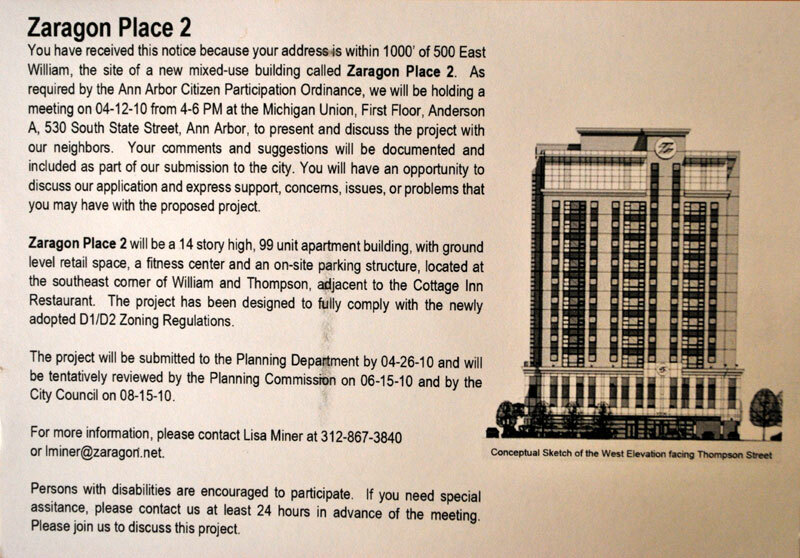 I wonder if Ann Arbor has such a limitation or is this an oversight on the part of our community given the relative newness of this type of project in our town? Knowing Dave and Mary, they are probably researching this issue as I am typing this. Re. impact on the future of the Cottage Inn site – I’ve got calls out to the Zaragon architect and to city planning staff to clarify that. As long as this project moves forward in compliance with D1 and the Downtown Plan, along with an attempt to incorporate the intent of the design guidelines currently being developed, I will support it. This is what my neighbors and I have been saying for two years: build tall, dense buildings where we have all agreed as a community that they should go–DOWNTOWN. There is no need to raid the neighborhoods, granting windfall variances for inappropriate projects when there are opportunities like this available in D1 and D2 districts. Hard to say how this will impact the numerous other downtown projects already approved that are just waiting for financing, but if the market is there, hopefully these will soon move forward, too. I also look forward to seeing Peter Allen’s new Kingsley Lane project come forward. Based on locations, these projects will focus on two different market segments, students and lower-salary workers, but both are on vacant land, properly zoned for the uses being proposed, and would not destroy thriving neighborhoods. Thanks for the write-up Mary! Zaragon Place 1 is sort of notorious for not having windows in every bedroom—it is one of the things people complained about before it was built and people who live there now also complain about. When I asked one of the developers about windows in Zaragon Place 2, he said that there would be windows in every bedroom and then murmured under his breath that the law had changed and they had to include windows in every bedroom. So I’m glad to see that, but kind of a shame that had to be legislated. When I asked them if any windows in the building would open, there was one resounding yes, one resounding no, and then some discussion back-and-forth. I guess it is still to be determined. The building will have almost no green/sustainable features and they are not planning to apply for any LEED or other certification. They might have a white roof for reflection, maybe some sustainable trim in the apartments (the rubber floors), and it will be made of concrete. Given the location, the fact that they are using unused space, and being close to transportation, those would probably qualify them for a basic LEED certification (which is what the Moravian proposed—it isn’t very stringent). They were pleasantly surprised when I told them the building would be directly next to two Zipcars. I thought the above-ground parking was interesting. They said it was much cheaper than underground parking and for their purposes it was a good use of the second and third floors. I’ve seen this in Chicago and Boulder and it seems to work well. You can’t usually tell it is parking from the outside. The retail space looked reasonable-sized. It was clear they would like to see a restaurant there, but are open to whatever the market bears. They are willing to divide the space or keep it as one bigger area. The glass will be clear. They said they realized on Zaragon Place 1 that even a bit of tint can negatively affect the interior tenant so they will go with all clear. Other than that, the general look will be very similar to ZP1. In general, I think it is a good building in the right place. I like the mix of apartment sizes. I like how it is stepped back and follows the design guidelines. I like that it fits in the zoning. I like that there is retail on William. I do think the proposed rent is crazy and can’t imagine there are so many people out there who can pay $1000/bedroom, but these downtown properties seem to be renting for that so you can’t blame them for going with the market. Sure, I would change some things if it were my building, but it isn’t, so I’m happy enough with this one. Aside from sheer height, aesthetic objections included the south wall of the building, which would be windowless – a blank wall. This was a design feature that planning commissioner Ethel Potts also lamented in her comments at that meeting. In response to the explanation that building codes prohibited windows in buildings built that close to the lot line, Potts said that it was the developer’s decision to go that close to the line, and that if windows were a priority, the building could have been set back from the line. Not window-related, but relevant to City Apartments: At last night’s city council budget meeting, Village Green’s City Apartments project received some discussion in the context of a question about a contingency to take on some additional debt to borrow the $3 million expected from the sale of that First & Washington property – if it does not come through sometime soon. The site approval has been extended once by city council through December 2009, with a provision that the city administrator can authorize two 3-month extensions, which he has done. When the second extension runs out at the end of June 2010, the council will need to act if there is to be an additional extension. At the council’s Monday budget meeting, the city’s CFO, Tom Crawford, indicated that he’d had recent conversations with Village Green and that they were feeling positive. The article mentions that preliminary renderings were available at the meeting. Are any of those available online? A quick search doesn’t get me anything. In the abstract case, the question of windows on interior lot lines brings up one of the dis-satisfactions I have with the A2D2 revisions: the “step-back setback” is not a zoning tool I’m fond of – I think it leads to buildings that look like they’re setting back on their haunches lazily, or look like they’ve been chopped off oddly, and leads to problems like, “what about windows?” Think the Federal Building, or the Q-Bert Building (One North Main), or old City Hall. By comparison, check out a historic building like the First National Building at the corner of Washington and Main Street: built in 1929, it is proudly front-loaded, with 10 stories straight up from the sidewalk, and it steps down towards the interior lot lines. Not only do I find this arrangement aesthetically much more appealing, but it’s the natural solution to “where do you put windows?” – well, you just don’t put your building smack up against the interior lot lines, is where. The counter-example, of course, is the oft-maligned Tower Plaza Condominiums, which demonstrates that front-loading can possibly be taken too far, but I don’t think many of that building’s detractors would like it any better if the tower were centered on the lot rather than up against the street. Re. the caption: You’re right – as is Tim Stout. I’ve fixed it. Murph, I got the sense it is going to look almost exactly like Zaragon Place 1 [link]. So I’m thinking “set-back” from the sidewalk is going to look a lot more like “building material change at the third-story.” Not sure what the zoning requires, but it didn’t look like it was actually stepped back much at all on the North and West at least. I don’t remember if they showed anything from the interior Cottage Inn/Maynard House perspective. Great reporting as usual, thank you. And thank you for pointing out the inherent greenness of increasing density anywhere you don’t need a car to get to class or work. LEED seems to be a tool for allowing people to feel good about building in the middle of nowhere. The two stories of less-expensive, above-ground parking is a great idea. A decade or two from now, one of them could be repurposed into living or office space while still leaving a floor for parking. We could have done something similar on the library lot. Juliew – cool deal. Zaragon 1.0 is not a bad-looking building, and I think the 3rd floor “change in materials” and mid-building cornice are good choices. As I’ve often heard from architects and design types, “a building should have a bottom, a middle, and a top”, and ZP1 does that.